Kulak (Ukrainian: kurkul, hlytai). A Russian term, now part of the English lexicon, for a peasant who owns a prosperous farm and a substantial allotment of land, which he works with the help of hired labor. The Stolypin agrarian reforms of 1906, which permitted well-to-do peasants to withdraw from the village commune (obshchina) and to purchase up to five allotted parcels of land, strengthened the position of such peasants. They were able to lease land, to hire seasonal and permanent farm laborers, and to buy farm machinery; their method of production began to resemble capitalist farming. In the Soviet period the term ‘kulak’ became an ambiguous Party construct but with a fundamentally negative connotation. At times it was applied to all well-to-do peasants; at other times it was used to tar all peasants who opposed Soviet rule. According to Soviet sources, in 1917 there were 518,400 kulak households—ie, owning over 6 desiatins in the steppe region, and over 10 desiatins elsewhere—in Ukraine; they constituted 12.2 percent of all peasant households. During the Ukrainian-Soviet War, 1917–21, the kulaks' farms were completely destroyed. The Bolsheviks confiscated all their ‘surplus’ grain, land, and in many cases, even means of production (livestock and machines). During the period of War Communism, Soviet decrees prohibited the exploitation of other people's labor and abolished the leasing of land, and the term ‘dekulakization’ was introduced to designate the official confiscation of land and property. 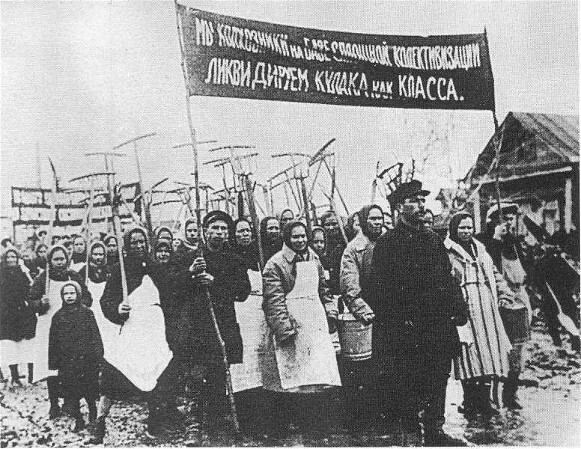 In Ukraine the First Congress of Committees of Poor Peasants passed a resolution on 18 October 1920 ‘to eliminate kulak farms as landowners' farms,’ to confiscate the kulaks' properties, and to drive the kulaks out of the villages. In practice the campaign resulted only in land redistribution and in the confiscation of the properties of only those farmers who had put up armed resistance to Soviet rule. Soviet leaders regarded the prosperous peasant strata as their chief internal enemy. Any rural revolt, including those led by Nestor Makhno and Nykyfor Hryhoriv, was attributed to ‘kulaks.’ Armed Bolshevik surplus-procurement detachments confiscated massive amounts of grain, which naturally aroused the hostility of not only those peasants who were directly affected but the rural population at large. During the period of the New Economic Policy, restrictions on land leasing and labor hiring were gradually lifted. In 1922, 6-year leases, and later 12-year leases, were permitted. Laborers could be hired as seasonal farm help or as permanent farmhands. In 1925 the Third Congress of Soviets permitted the hiring of 12–14-year-olds. However, the equal distribution of land among the peasantry had undermined the economic basis of hired labor, and the dominant figure in the village at that time became the middle peasant, ie, a peasant who farmed the land he owned by himself. In 1926, 10 percent of the peasants in Ukraine owned less than 1 desiatin of sown or unsown land, compared to 32 percent in 1917; 70 percent owned 2–8 sown desiatins, compared to 39 percent in 1917; and only 8 percent owned over 8 desiatins, compared to 16 percent in 1917. According to the Soviet census of 1926, 738,000 farming families, 120,000 of them in Ukraine, used hired labor, and there were 883,000 farm laborers in the Union of Soviet Socialist Republics, 122,000 of them in Ukraine. Most of the hired laborers were shepherds, blacksmiths, agronomists, and children's nurses. The principal employers were not rich but poor peasants: single women who needed male workers, juvenile and aged heads of households, and farmers who did not own a horse and depended on their neighbor's draft animals to plow their fields. The formerly rich peasants, having had their surplus land confiscated but still having large families to support, were forced to sell their labor to make ends meet. Compared to the total population occupied in farming, the number of hired hands was trivial. In Ukraine, excluding shepherds and youngsters, there were 66,000, or 0.3 percent of all those engaged in farming. The sample agricultural census of 1927 showed that outside help played practically no role in agricultural production and amounted to only 1.5 percent of all labor expended per household. Even among the most prosperous peasant households—those with over 1,600 rubles' worth of the basic means of production—half did not use hired help at all; among the other half, in the USSR hired labor accounted for only 7 percent, and in Ukraine for only 5 percent, of their work force. After deducting expenses, hired labor provided only 1–2 percent of a ‘kulak’ family's net income. Although Soviet policies had deprived them of their economic status, the ‘kulaks’ continued to be regarded as class enemies by the authorities and were not allowed to vote in elections to the rural soviets, to hold governing positions in co-operatives, or to receive bank loans or tax reductions. Their children were not allowed to join the Red Army or be admitted to post-secondary schools. Local security police agents (see GPU) and their secret informers were ordered to keep expropriated ‘kulaks’ under close secret surveillance. Soviet propaganda continuously heaped abuse on the ‘kulaks,’ blaming them for every economic difficulty and accusing them of criminal designs. Yet, there were no objective criteria for identifying who was a ‘kulak.’ A Party commission estimated on the basis of the sample agricultural census of 1927 that 3.9 percent of peasant households were ‘kulak’ because they employed hired labor and owned a relatively large share of the means of production. This estimate was applied in making all subsequent Party decisions; eg, in 1929 higher taxes were levied on 3 percent of peasant households, and 4 percent of the peasantry were deprived of the right to vote in elections to the rural soviets. The peasants who were classified as 'kulaks' were not rich in the usual sense of the word. The value of their property, including their house and other buildings, was about 1,000 rubles, their average annual income was 1,200 rubles (190 rubles per family member), and they lacked farm machines and draft animals. Individual incomes among the rural proletariat were only half that of the ‘kulaks,’ but poor peasants and village leaders of poor-peasant backgrounds paid lower taxes, did not bear any production costs, and hence could afford to buy more manufactured goods. Urban residents could afford to spend several times more than the ‘kulaks’; they consumed more meat, butter, and fruit, bought more consumer goods, and received better medical care. In comparison to a Soviet urban functionary, a ‘kulak’ was practically a pauper. In 1928 and 1929 the government introduced special measures against the ‘kulaks.’ Their agricultural taxes were increased from 100 to 267 rubles per household. Their state grain-delivery quotas were also raised, and the family head became subject to criminal prosecution for non-fulfillment. Thus, thousands of individuals had their property confiscated. According to a report given at the 11th CP(B)U Congress, in 22 of Ukraine's 41 okruhas, 33,000 people had been prosecuted and lost their farms in 1929. An even larger number of peasants were fined, and rural officials were empowered to impose fines equaling five times the amount of the unfulfilled quotas. Consequently, many peasants abandoned their farms and fled to the cities to work in construction or moved to other regions of the USSR. The number of ‘kulaks’ thus fell rapidly. By spring 1929 a sample census gave the figure as 71,500 (1.4 percent of all households compared to 3.8 percent in 1927) in Ukraine. At the beginning of the collectivization drive in 1929 the party decided to ‘liquidate the kulak as a class,’ and a special commission headed by Viacheslav Molotov was established to determine what to do with the ‘kulaks.’ According to Party and government decrees issued in January and February 1930, in regions targeted for ‘total collectivization’ the law allowing land leasing and hired labor was abolished and the confiscation of the ‘kulaks'’ property and their deportation was allowed. Molotov's commission divided the ‘kulaks’ into three categories: those who were to be arrested and imprisoned in concentration camps or shot; those who were to be deported to Siberia; and those whose property, including their homes, was to be confiscated and who were to be resettled in other regions in their oblast. In Ukraine alone the first and second groups encompassed 40,000–50,000 households, while the third group included about 200,000 individuals. The decisions of the Molotov commission were implemented almost immediately, beginning in February 1930, and were zealously pursued by special armed dekulakization brigades made up of Party activists, Komsomol members, urban residents, and employees of the OGPU and the Party apparat. Peasants were informed that their property no longer belonged to them and were forbidden to slaughter or sell livestock and to leave their villages without permission. All confiscated property was transferred to the newly formed collective farms. To prevent kulaks from divesting themselves of their property before it could be confiscated, Joseph Stalin ordered collectivization to be speeded up. Dekulakization became a powerful inducement for all peasants to join collective farms, for they thus avoided being branded enemies of the state and sharing the tragic fates of those who had already become victims. Rural Party activists needed little encouragement to participate in sanctioned robbery of their neighbors. In the first two months of the dekulakization campaign, 3–4 percent of the peasants in the grain-growing regions of Ukraine were expropriated. By 10 March 1930, in the 305 raions of Ukraine 58,520 horses and oxen and 586,400 ha of land were confiscated from 61,897 dekulakized households. Figures in the accompanying table show that, except in Polisia, where the number of those dekulakized was small, a ‘kulak's’ property was worth less than the Soviet average of 770 rubles. In other words, at the time they were robbed the ‘kulaks’ were not rich but poor peasants. A ‘twenty-five thousander,’ one of the 25,000 industrial workers who were Party members and usually led dekulakization brigades, could buy two or three ‘kulak’ farms with his annual salary. At the same time that targeted peasants were being openly robbed, other well-to-do peasants were subjected to increasingly heavy taxes. Thus, in 1931 a ‘kulak’ whose annual income was 1,000 rubles paid 840 rubles in taxes, while urban workers and functionaries with salaries of 1,200 rubles paid only 22 rubles, thus giving them a net income 7.4 times greater than that of their rural counterparts. This injustice was made even graver by the fact that the purchasing power of the ruble in the rural private sector amounted to only 16 percent of that in the urban state sector; in other words, a peasant's ruble bought only one-sixth the goods a worker's did. By 1 July 1930, 93,000 peasant households had been dekulakized in Soviet Ukraine; the value of their confiscated property amounted to nearly 50.2 million rubles. A comparison with the figures for 10 March 1930 shows that increasingly poorer peasants were dekulakized. By the end of 1930 dekulakized households numbered 160,000–200,000 in Ukraine. An additional 50,000 farms were confiscated for non-payment of taxes. Hundreds of thousands of peasant families ‘dekulakized’ themselves: they abandoned their farms and fled to the cities. Dekulakization continued in 1931, mostly in the form of confiscation of property of those who owed taxes. A total of 200,000 households in Ukraine were taxed individually, and 110,000 of them disappeared in the course of the year. Thus, in 1930–1 the total number of those dekulakized in Ukraine amounted to 300,000 families, or almost 1,500,000 people. By 10 March 1930, 11,374 peasant families—one-third of all those dekulakized—had been arrested and deported from the 11 regions targeted for rapid collectivization in Ukraine. During the entire collectivization period the number of families deported from Ukraine was 60,000–100,000 (300,000–400,000 people). Many of those inhumanely deported ended up in prisons or concentration camps; others died in transit or during the first months or years of exile. A secret instruction issued by Joseph Stalin and Viacheslav Molotov on 8 May 1933 ordered an end to the mass deportation of peasants and set a final limit of 2,000 for Ukraine. In the 1930s the term ‘kulak’ thus ceased to have any economic significance and was used only as a political label. A new term, ‘subkulak’ (podkulachnik), was applied to anyone, including collective farmers and poor peasants, who sympathized with the plight of the persecuted and disagreed with the actions of the authorities. At the same time, incompetent or dishonest collective-farm managers, bookkeepers, and clerks were labeled kulaks and accused of treacherous designs. Later, the term was applied to the helpless poor who lived on charity and thus unintentionally exposed the state of economic conditions in the countryside. The peasant deportees were resettled in the wilderness of sub-Arctic Russia, the northern Urals, western Siberia, and Kazakhstan. There they lived in special colonies run by the OGPU. Most were organized into collective farms called statuteless artels, which did not have an elected leader. Others were forced to work in dangerous mines. Treated as subhumans, many of them died from starvation, cold, or disease. In spring 1930 the rate of collectivization was reviewed, and special commissions ‘rehabilitated’ about 10 percent of the deportees and permitted them to return home. With time, the situation of the deportees was normalized. The 1936 Constitution granted them the right to vote. In 1938 their collective farms became normal artels, and after the Second World War they were allowed to return home. It should be noted that the position of the ordinary collective farmer who had not been deported was not much different from that of the ‘kulak’ who was. 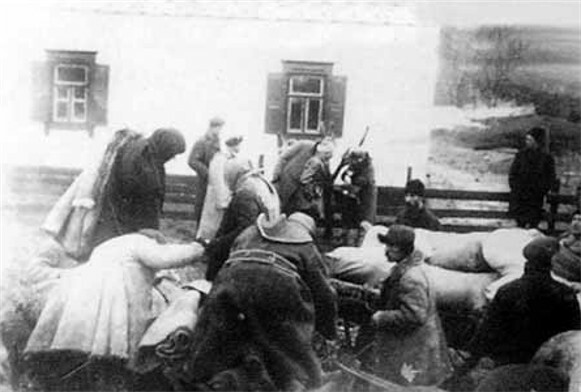 In 1932–3 the confiscation of surplus grain was extended to all peasants and not just ‘kulaks.’ Gradually the special measures used to repress the latter were applied to all economically independent peasants who did not join the collective farms; later all peasants were saddled with excessive taxes and compulsory deliveries of meat, milk, and agricultural produce. In the mid-1930s all rural residents in the USSR were deprived of internal passports and thus of the possibility of leaving their places of residence. Dekulakization was an essential element in the collectivization drive. It ensured the Stalinist regime's victory in the countryside and its complete control over the peasantry. It also undermined agricultural productivity and significantly depressed the living standard. The peasantry lost interest in and the incentive to work. Dekulakization had tragic consequences for the Ukrainian nation and economy (see Famine-Genocide of 1932–3).